We are back with a fresh new sketch by Linda at Freshly Made Sketches! I still had my Buzz & Bumble Workshop on the Go Kit on my desk...and decided the faux wax seals would be a perfect fit for the sketch. 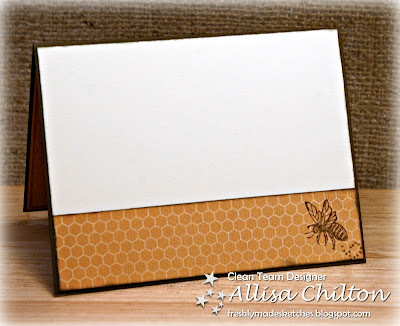 While I have never been a fan of bees, this paper pack is quickly becoming a favorite. Just in case you missed my previous card, you can view it here. Here is a look at the original sketch, feel free to change out the shapes in your own design. The faux wax seals come as a solid color and look just like real wax seals, down to their imperfect edges. I added highlights to mine with a gold metallic marker. I wanted the seals to be more of a focal point of my card and the gold really helps them shine. I added a few details to the inside and kept it blank for more writing room. The bee and swirl stamp are included in the kit! The swirl is actually a long border stamp, I only used a small portion on the inside corner to add some movement to my bee. This is beautiful - I love those wax seals - what a great effect! Really adorable card. Love the layout. Thank you for joining our challenge at Sweet Stamps. Very cute. Love how you stamped the inside. 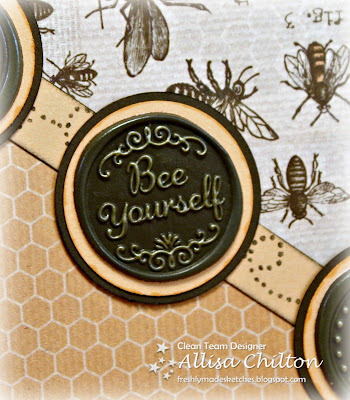 Welcome to the "Gone Country" Challenge at Craft Your Passion Allisa... Fun layout, love the use of the faux wax seals for your three circles, and I especially like what you did in the inside! well done Allisa! Pretty card:) I really like the wax seals-very cool! Fabulous card Allisa! That paper is awesome and I love those faux wax seals! They are perfect for this sketch! I think your card looks great - such fab papers and design, perfect for this bee-themed card! Great take on the sketch! This is SO pretty! 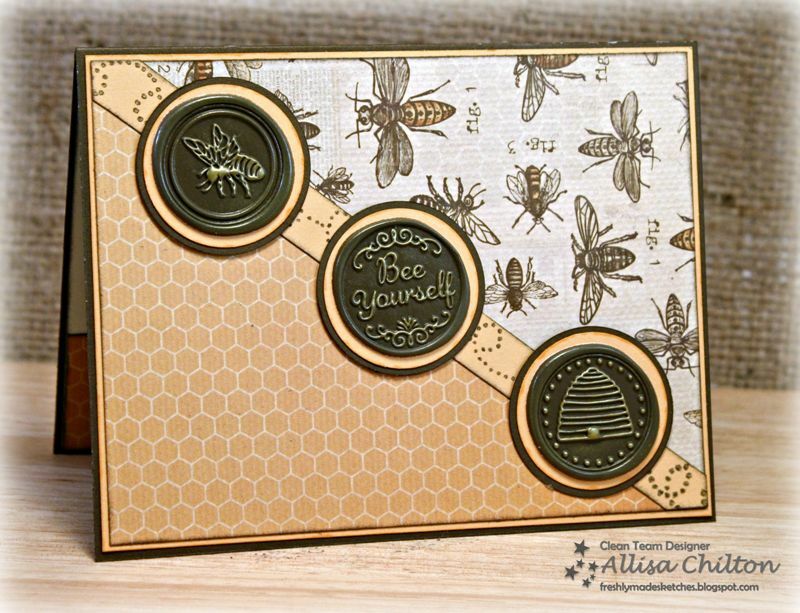 I love the wax seals and the bee theme. So gorgeously done! What a super card! I've never seen faux wax seals before. They're fabulous!! I love everything about this card! The papers/colors are fabulous, and those wax seals are awesome. I love how you added a little bit of gold to them. LOVE IT! Wow .... absolutely stunning Alissa! I loooove the wax seals and your gold touches is just perfection! I love this card! It is just awesome!! Thanks for playing at My Craft Spot.